Italy, land of pasta. Many varieties and many recipes for a centuries-old tradition. From Campofilone, in the region Marche, an excellence of Made in Italy: the ‘Maccheroncini di Campofilone’, which got the mark of Protected Geographical Indication (IGP) thanks to a rigid protocol of production. The first certain documents which mention this pasta - also called ‘angels’ hair’, in Italian ‘capelli d’angelo’ - dates back to the Council of Trent in 1560 and use the following words: “so thin that it melts in your mouth”. They are also mentioned in the cookery books prepared for some noble families of Marche of 1700. The poet Giacomo Leopardi in its 49 most wanted dishes listed three different ways in which he preferred the Maccheroncini di Campofilone as a reminder for his chefs. Eggs by free-range hens GMO-free, top-quality semolina flour, a little salt, all strictly coming from Campofilone; water is not used for producing this pasta, whose very thin sheet never exceeds 0.7 mm and is characterized by a thin cut, of at most 1.2 mm. Its production method strictly follows the tradition of pasta of Campofilone, handed down from generation to generation, when housewives worked at home and laid the sheet they had prepared on large slabs of marble, and then let the dough rest in cotton clothes. Its proteinaceous semolina with very high gluten index guarantees that it stays firm after cooking (it cooks in just 90 seconds) and preserves the aroma of eggs. It is a scented pasta, characterized by pleasant visual impact, with its strong yellow colour which reminds naturalness of the eggs. The result of this care is an ancient flavour, naturally pleasant, versatile in cooking and enhanced by the rich traditional sauces of Marche, which are well absorbed thanks to the manufacture of this pasta. For instance, the recipe with white sauces of fish, in which the Maccheroncini di Campofilone directly cook in their sauce, is much appreciated. From the meeting between the great tradition of pasta of the region Marche and amount of organic eggs produced at Campofilone, a real ‘design’ of egg pasta has recently developed. 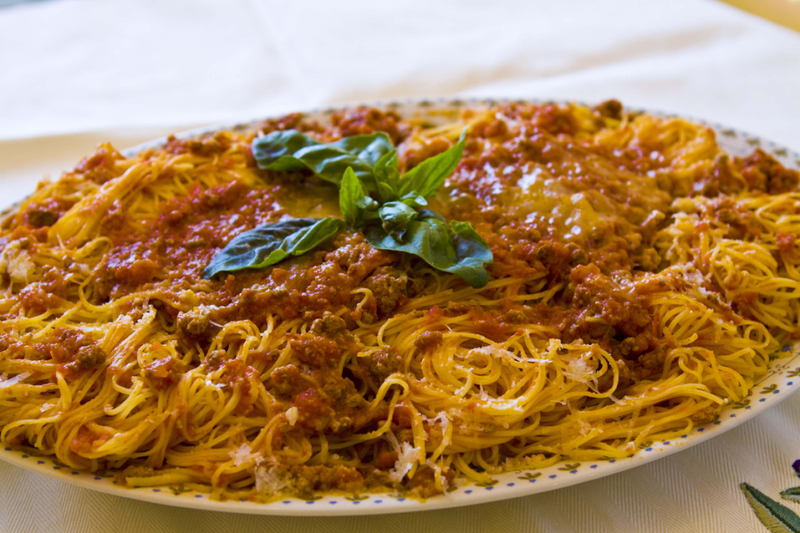 Besides the fine and famous Maccheroncini, Linguine, Tagliatelle, Fettuccine, Pappardelle, and Maltagliati, too, are produced. The basic idea always consists in eggs and flour, but their cut changes, for a tasty choice in the field of ‘pasta lunga’. ‘Spaghetti alla chitarra’, too, have been recently produced, always with the basic recipe of Maccheroncini, with at least 30% organic eggs. The width of cut of this pasta is about 3 mm, with the same thickness, so that, if seen ‘in section’, they seem square, just as guitar strings. This pasta is especially suitable for important sauces. Campofilone is a small town in the province of Fermo, whose hills stretch out quickly into the sea, creating a beach of more than km 2. The municipality covers an area of ​​just 12 square kilometres, with 1,600 people who apply themselves m ainly to agriculture. 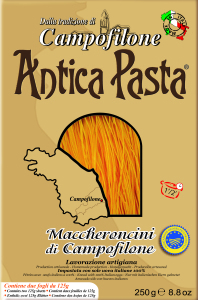 Brazil, Russia, China, and Southeast Asia are the new customers of this pasta, but also USA, Australia, and England. 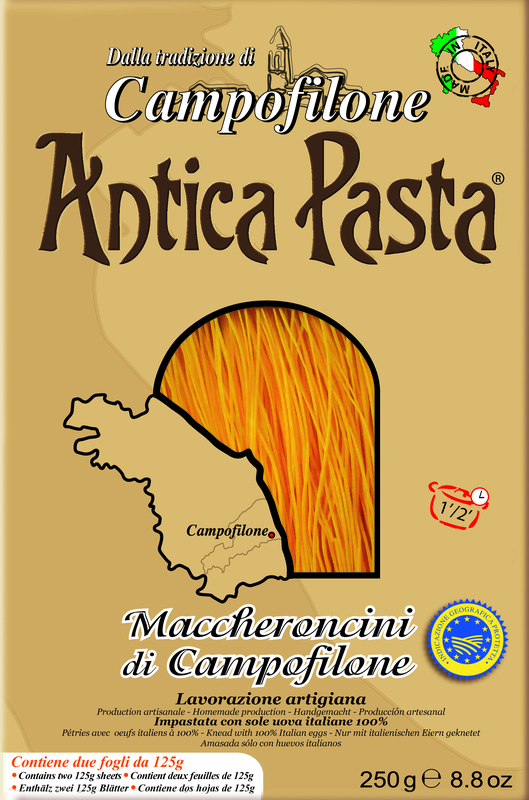 As for packaging, the factories which produce the ‘Maccheroncini di Campofilone’ must use labels approved by the Consortium only. The packs are generally made ​​of cardboard, simple, but characterized by modern design, with a window which allows admiring the incredible colour of this egg pasta. The absolute rigour in production methods is respected also in the methods of packaging: the name ‘Maccheroncini di Campofilone’ must have a height of at least mm 5 and cannot be translated. In addition, any add of qualifications is forbidden. Especially for foreign market, tin packs, too, are produced.